This year’s 2018 Tournament of Roses Queen Isabella Marie Marez holds close family roots here in our local community of Hillside. Isabella is the daughter of Jesse and Christine Marez. She has four siblings, Alexandra, Jennifer, Justin and William. Her father Jesse Marez along with his eight other siblings were raised in Hillside Village where they all attended Wilson High School. Her grandparents Jose and Manuela still reside at the family home on Almadale Ave. where they’ve resided since the mid 1970’s. As a resident of Altadena, Isabella had to survive a deeply competitive application and interview process in order to be chosen Rose Queen, as close to one thousand applicants sought to win this very distinguished ambassador position. 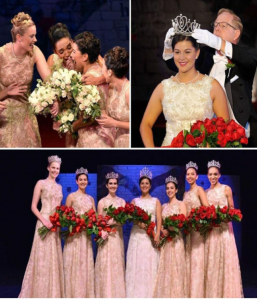 The criteria that the Tournament of Roses Queen and Court Committee use to select their annual Rose Queen includes: poise, speaking ability, academic achievement, youth leadership, and community and school involvement. Other extra-curricular activities in which she is involved in include: being a Youth Ministry Leader, a leadership service commissioner at La Salle High, a member of the Support our Troops Club, Key Club, Hispanic National Honors Society, and National Arts Society. She also serves as a Junior Ambassador for Children’s Hospital Los Angeles. Her duties as the 100th Rose Queen are to be a lifelong Ambassador of good will to her fellow man, make more than 100 media and community appearances as an Ambassador for the Tournament of Roses Parade. On January 1st 2018 she, along with her six other Rose Court Princess’ will ride on the Rose Parade float and attend the Rose Bowl game. She plans on studying social justice and human anatomy and would like to attend Seattle University, Manhattan College, Regis University, Villanova University, Drexel University, or Sarah Lawrence College. Isabella, along with her six other beautiful and very academically refined Rose Princess’ will be in full view on January 1st, as they fulfill their roles as ambassadors for the 2018 Annual Tournament of Roses Parade on Channel 5 KTLA. Your family’s community beams with pride at your distinguished accomplishment Isabella. We wish you the greatest of success in your young life. © 2010 LA Hillside Village. All Rights Reserved.